I posted this earlier today when the news broke and I left the story as you see it above for the time being. I wanted to have time to think about Johnny and what he meant to me. I grew up watching this guy every night. In high school, I’d stay up late just to watch the fun. When I got married in 1969, my wife and I used to stay up and watch Johnny, Ed and Doc every weeknight. What made his show so attractive? Beats me. There were always funny guests and stars promoting their latest movies. It was fun and games late at night. The guests were treated as special and everyone had a shot at Johnny (which he took with good-natured charm all the time). Comedy skits with Carson as Karnak The Magnificent or Art Fern or Aunt Blabby just added to the fun. If I had to put my finger on any one thing that made the show and Johnny so much fun to watch it would have to be that it was always entertainment. If news was presented, it was always with a tongue in cheek humor. If politicians came on the show (rarely) they were carefully guided by Johnny away from political arguments. Most importantly, Johnny left the spotlight to his guests and never tried to upstage any of them. He was a one of a kind and a class act. Leno, Letterman, Conan, et al are all mere shadows of Johnny. 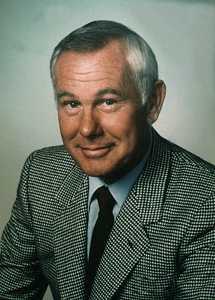 I guess if I had to really confess how much Johnny Carson meant to me, I’d have to simply say .... I stopped watching late night TV when he retired. There can be only one. So long Johnny .... and thanks.